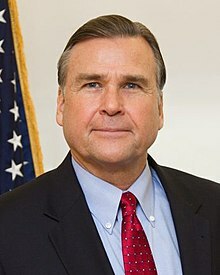 Following growing pressures from the Federal Government accusing the United States of bias, the American Ambassador to Nigeria, W. Stuart Symington has clarified that his country was not taking sides but supporting a level playing field and the democratic process in Nigeria’s election. Symington made the clarifications in a statement released on Tuesday. “The United States Embassy in Nigeria wishes to reiterate unequivocally that we are not taking sides in Nigeria’s election. We do not support any party or candidate. We support a level playing field and the democratic process. That is the bedrock principle of our Government’s advocacy on democratic elections. In the final run-up to the Feb. 16 vote, fake news and rumors are operating in overdrive. But it must be repeated: we are not taking sides. “This is Nigeria’s election and the citizens of Nigeria will decide who will lead their nation. It is important for the future of every Nigerian and it is important that every Nigerian contribute to making it a democratic, peaceful, free and fair process. This will ensure that all Nigerians see the results as credible, and they accept them. This will empower Nigeria’s democracy going forward, as did the elections of 2015. “Every Nigerian citizen is vital to the success of this election. Each person is responsible for his or her own actions and words, and all must be held accountable: first by their own conscience, then under God, then in accord with the laws of Nigeria and in the court of Nigerian public opinion, and also in the eyes of the world. “This election is Nigeria’s, but it is also important for Nigeria’s neighbors and for the world. Nigeria has long played a great leadership role in the region and beyond as a force for democratic stability. The credible electoral results of 2015 empowered Nigeria to play that role. The United States looks forward to a similar result this week.